Lock in a great price for Holiday Inn Hotel & Suites Durango Central – rated 8.5 by recent guests! Breakfast was made to order, but they have a buffet available when busy. The desk staff was very friendly and helpful. The location was great. It is pet friendly, with areas to walk your dog even when there is a lot of snow. Clean and new. Hotel in a great Colorado destination! The place is close to downtown. Convenient to everything. It's not walking distance, but it's a short 5 to 7 minute drive from hotel to mainstreet. The facility is newer so e everything is clean and in working condition. The room was very clean and the beds were comfortable. Bed was comfortable but heard horror story re hotels in gen, they don't change sheets if they don't look dirty regardless if new customers so I requested clean sheets to change my own. Easy access for travel to downtown and to Mesa Verde. 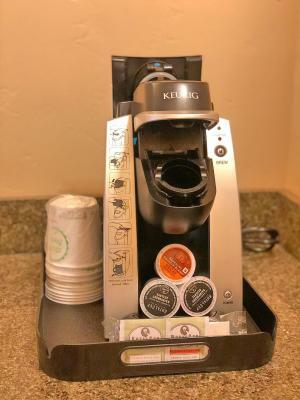 Holiday Inn Hotel & Suites Durango Central This rating is a reflection of how the property compares to the industry standard when it comes to price, facilities and services available. It's based on a self-evaluation by the property. Use this rating to help choose your stay! Located off Highway 160 and just 3 minutes’ drive from Durango town center, this hotel features an indoor pool and hot tub and an on-site restaurant. All rooms are equipped with free Wi-Fi. A cable TV is offered in each air-conditioned guest room at Holiday Inn Hotel & Suites Durango Central. All rooms include a work desk, a microwave and a refrigerator. Select rooms feature fireplaces or relaxing spa baths. Serving breakfast, lunch and dinner, Sporting News Grill is located on-site at Durango Central Holiday Inn. Westside Pub & Grill is a full service restaurant with a bar. It also offers room service to hotel guests. A business center with fax and photocopying services is located at Holiday Inn Durango. Guests can work out in the on-site fitness center. Durango-La Plata County Airport is 14 miles away from this hotel. Sky Ute Casino & Resort is 30 minutes’ drive away. When would you like to stay at Holiday Inn Hotel & Suites Durango Central? Bed type preference cannot be guaranteed as it will be allocated upon arrival based on availability. Maximum occupancy is 2 guests. 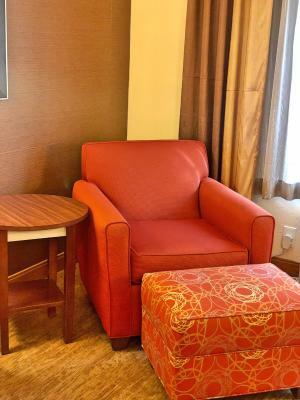 Featuring free Wi-Fi, this air-conditioned room includes a cable TV, a work desk, a microwave and a refrigerator. With free Wi-Fi, this air-conditioned hearing accessible room includes a cable TV, a work desk, a microwave and a refrigerator. Offering free Wi-Fi, this air-conditioned disability access room includes a cable TV, a work desk, a microwave and a refrigerator. Roll in shower included. With free Wi-Fi, this air-conditioned room has a cable TV, a fireplace, a work desk, a microwave and a refrigerator. With free Wi-Fi, this air-conditioned room has a cable TV, a work desk, a microwave and a refrigerator. Room has a balcony. Featuring free Wi-Fi and a spa tub, this air-conditioned room includes a cable TV, a fireplace, a work desk, a microwave and a refrigerator. This double room has a balcony, a sitting area and a microwave. This room has a seating area with a microwave and a small refrigerator. An private bathroom with a stand alone shower is also included. This double room features a fireplace, a cable TV and a microwave. House Rules Holiday Inn Hotel & Suites Durango Central takes special requests – add in the next step! Holiday Inn Hotel &amp; Suites Durango Central accepts these cards and reserves the right to temporarily hold an amount prior to arrival. Holiday Inn Hotel & Suites Durango Central accepts these cards and reserves the right to temporarily hold an amount prior to arrival. Didn’t have the room we reserved from online. Staff was great, except for the one person who checked us in. Kind of ruined the whole mood for check-in, but manager & another staff member helped us out and got everything situated! They went out of their way to make us happy again! Dinner & breakfast in the on-site restaurant was great! Servers were so nice, helpful & friendly. I had a good time in the room. We had our dog with us and housekeeping did not want to clean our room. We only got cleaned once while we were there. One day they ran out of clean towels. The evening service in the restaurant was not good. Price was high for the normal Holiday Inn Express. The first Holiday Inn Express that did not serve breakfast. Stayed a couple nights and our room did not get cleaned once. On the day I was scheduled to checkout, housekeeping came to clean the room at 0815, well before I had even checked out. She seemed bothered that I was still there and kept asking what time I was going to leave. The entrance to the hotel is not clearly marked. Drove past it once or twice because we couldn't see the entrance at night. They need better signage to show the entrance off the highway. Not aware that pets allowed. Allergic to pet dander so hated to see dogs all over the place. Room noisy. I think we were next to the elevator.